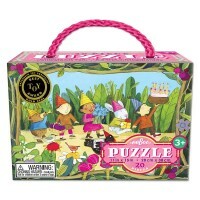 Celebrate a sunny day with the Bear on Bicycle and his animal friends putting this 20 piece puzzle together. Celebrate a sunny day with animal friends! The Bear on Bicycle 20 pc Jigsaw Puzzle from eeBoo’s 20 Piece Puzzle collection is a great party favor or a small gift for your special child. 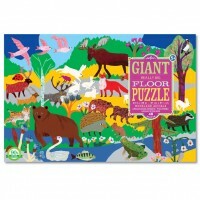 This animal theme puzzle features jumbo size pieces with artistic illustrations. 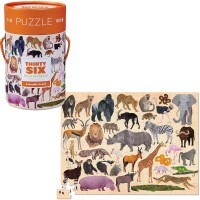 This friendly animals puzzle includes 20 large size puzzle pieces that are made with 90% recycled greyboard and comes neatly packed in a carrying box with purple rope handle. 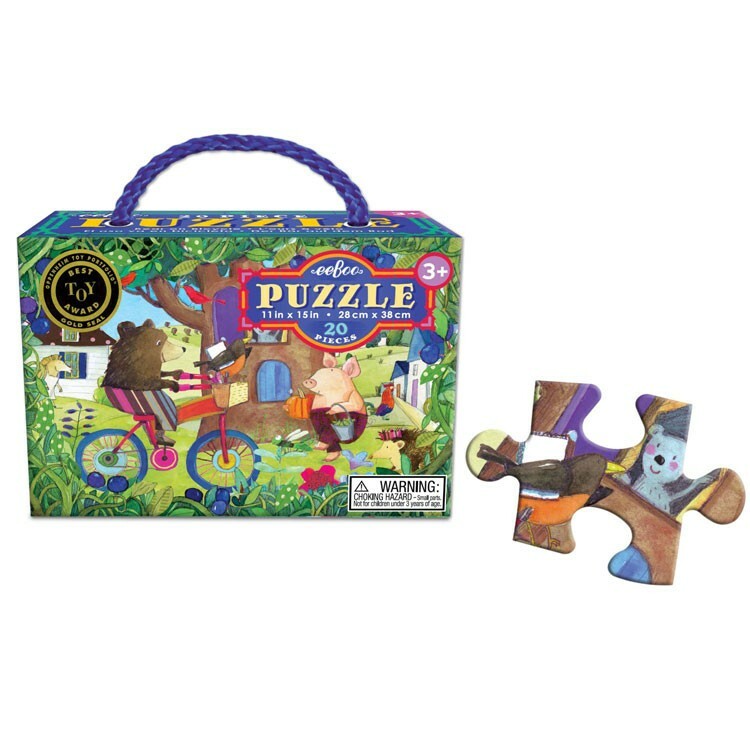 Assembled Bear on Bicycle 20 pc Jigsaw Puzzle from Educational Toys Planet measures 11 x 15 inches. 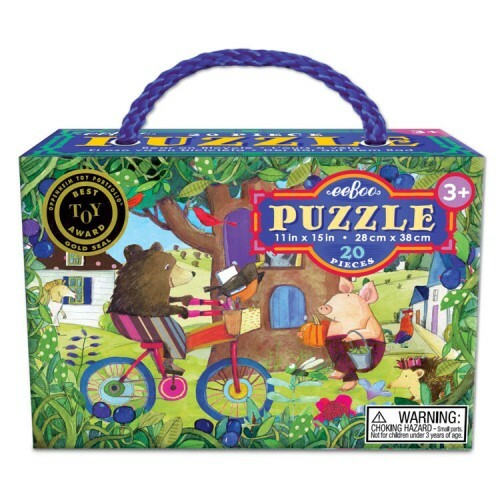 Dimensions of package 2.2" x 5.2" x 3.82"
Write your own review of Bear on Bicycle 20 pc Jigsaw Puzzle. 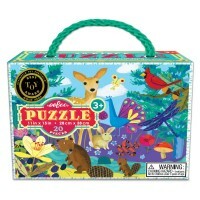 Rating: 5 Great puzzle for toddlers by By A customer Both this and the dinosaur meadow puzzles are great! Big fan of eeboo. Pieces fit well together and my 2.5 year old can do it almost on his own. 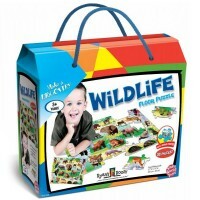 The carrying box is very portable - much better than carrying and storing a full size box. Rating: 3 These are TINY by By A customer For size perspective, I’m including a photo next to a loaf of bread. I really can’t describe this as a sturdy storage box either so I’m a little surprised at all the great reviews. Not worth returning but still, overpriced in my opinion. 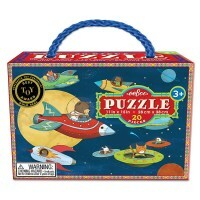 Rating: 5 Perfect for 3 year old by By A customer My 3 year old grandaughter loves these puzzles. Just the right size and number of pieces to be challenging but not overly so. She needs a little help, but that's where grandma comes in to play. 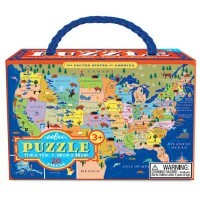 Rating: 5 Fun, colorful puzzle by By A customer We absolutely love this puzzle! So colorful and fun. Perfect size for the little ones. 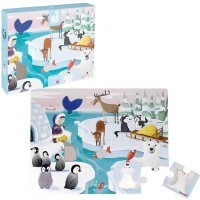 Rating: 5 Five Stars by By A customer My granddaughter and I loved this puzzle. Rating: 5 Beautiful, excellent quality, great price by By A customer Beautiful! Sturdy pieces that fit together perfectly. There's even a pattern on the back of each piece that looks so much nicer than plain cardboard. 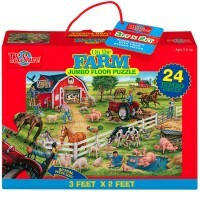 My 4 year old did the puzzle 6 times on the day it arrived, and insisted we bring it to the park to show his friends. 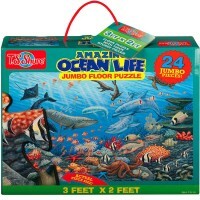 Will buy more puzzles from this company for sure!